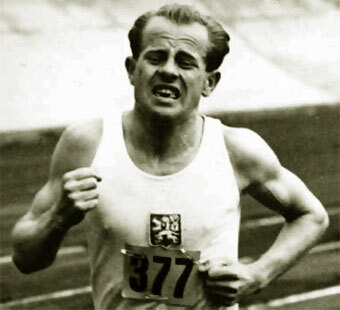 At the 1948 London Games Czechoslovakia’s great long distance runner Emil “The Czech Locomotive” Zatopek won the 10000 meter and won the silver in the 5000. In the 1952 Helsinki Games Emil Zatopek ruled. He won gold in the 5000, 10,000 and in the Marathon. Emil Zatopek was born on the same day/year as his wife Dana, September 19,1922. She was also won medals in the Olympics, a gold in the 1952 in the javelin and a silver in the javelin in 1960 Rome Olympics. When Emil Zatopek ran he looked like he was in a great pain. He looked like he was about to collapse. He would have a grimace on his face, he would make noises as he ran-panting and wheezing as he went about.When asked about his tortured look while running he said ” I am not talented enough to run and smile at the same time” He had different training methods. In the winter he would run in his work boots instead of athletic shoes. He was always willing to give advice to other runners. He was admired and loved by his competitors and anyone who met him, unlike say a Paavo Nurmi who was not a nice man. After winning the 5000 and 10000 meters in Helsinki, he decided to run the Marathon, a race he had never ran before. He wasn’t worried about being able to cover the distance, he was concerned about the pace and how to pace himself. He believed Jim Peters of Great Britain was the man to beat so he ran with him awhile. It was a fast pace. At one point Emil asked Peters if the pace was alright and Peters said “Too Slow” not long after that Emil took off from the pack and would win the Marathon by 2 1/2 minutes. Before the 1956 Olympic Games Emil Zatopek had a groin injury while training that hospitalized him for 6 weeks. The first day he was out of the hospital he resumed his training but never quite regained his form. He finished 6th in the Marathon. He would retire from competition in 1957. My favourite Emil Zatopek story and one that tells you what kind of man he was, and why he was so loved is this one. 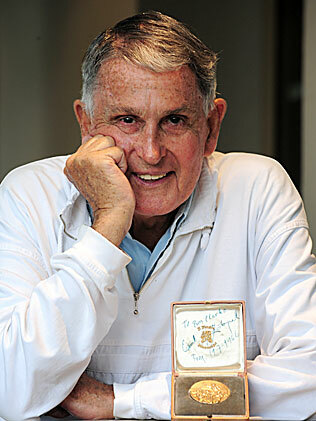 Ron Clarke was a great Austrailian long distance runner in the late 50’s and 60’s. Ron Clarke had bad luck in the olympic games and never won a gold medal. Clarke was in Prague and on the day he left Emil took him to the airport. Before Ron Clarke got on the plane Zatopek handed him a box poorly wrapped brown box. Clarke was a little bewildered. Was he being asked to smuggle something out of communist Czechoslovakia? When he got on the plane and opened the box he saw what Emil Zatopek said he deserved- a gold medal. Emil had given him one of the gold medals he had won in the Olympic Games. Pictured below Ron Clarke with that gold medal. Emil Zatopec died in 2000 at the age of 78. Without question Emil Zatopec is my favourite all-time Olympian.